How Do You Rate Crime Downtown? The ratings have dropped significantly over the summer. The drop in crime is much greater than the overall drop. 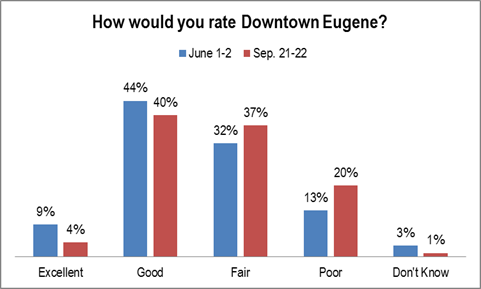 METHODOLOGY: 200 telephone interviews of City of Eugene likely general election voters were conducted the nights of June 1-2 and September 21-22, 2015. The margin of error at the median is 7%. Figures may not add up to 100% due to rounding. 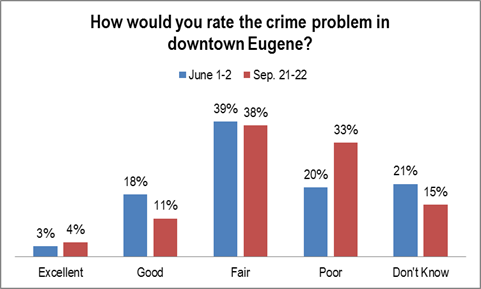 Category: Eugene and Lane County, Political | Comments Off on How Do You Rate Crime Downtown? How Do You Rate Downtown? The ratings have dropped significantly over the summer. Category: Eugene and Lane County, Political | Comments Off on How Do You Rate Downtown? There is solid support for voting on the stormwater fee, rather than just having the city council impose it. The margin is overwhelming. 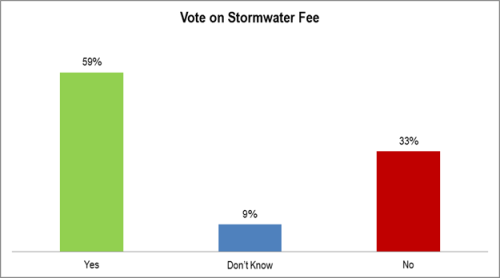 QUESTION: Should the City of Eugene vote on whether to increase the stormwater fee? METHODOLOGY: 200 telephone interviews of City of Eugene likely general election voters were conducted the nights of September 21-22, 2015. The margin of error at the median is 7%. Figures may not add up to 100% due to rounding. 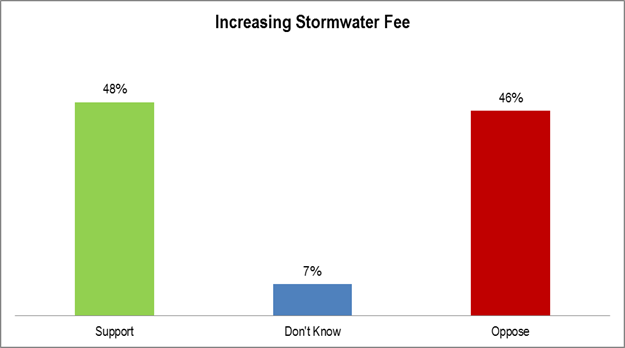 Increasing the stormwater fee is supported very narrowly – much less than the margin of error. In addition, the level of support, under 50%, is definitely not enough to guarantee an win at the ballot. QUESTION: Do you support or oppose increasing Eugene’s stormwater fee by $12 per year for every business and residence in the city to pay for park maintenance? Following up on the sufficiency of the laws, we asked if the state government had done enough. Oregonians rated “no” by a 41% to 31% margin. More telling is the nearly one-third who responded “Don’t Know.” This group needs to be convinced and could be a critical voting block in 2016. 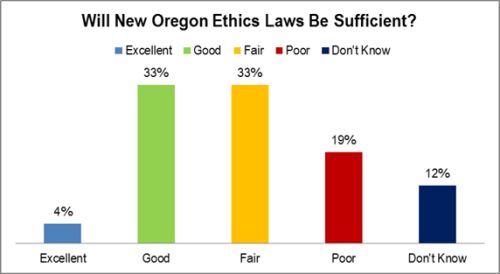 QUESTION: Did the state government do enough to improve Oregon’s ethics laws? 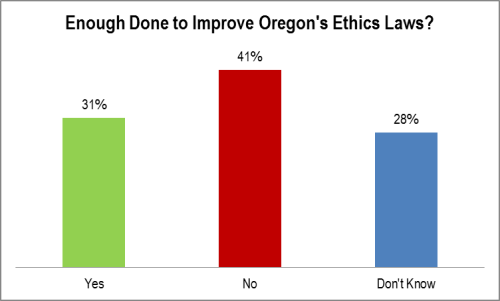 METHODOLOGY: Live telephone interviews of 400 likely Oregon gubernatorial general election voters were conducted September 14-16, 2015. The margin of error at the sample median is 5%. Quotas were established based on gender, age, party, and region. Totals may not equal 100% due to rounding. Oregonians think the new ethics laws might not be sufficient. No Added Gas Tax in Oregon? 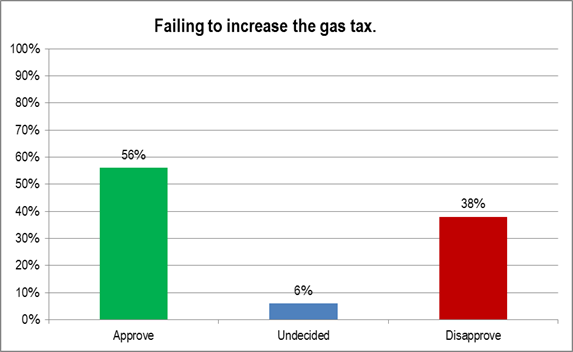 Respondents to the failure to pass the gas tax are clearly cross-pressured. By that I mean that some would prefer this to clean fuels and those same would prefer no new taxes. QUESTION: A number of laws were passed by the legislature and signed by the Governor. Do you approve or disapprove of failing to increase the gas tax. Category: Oregon, Political | Comments Off on No Added Gas Tax in Oregon?